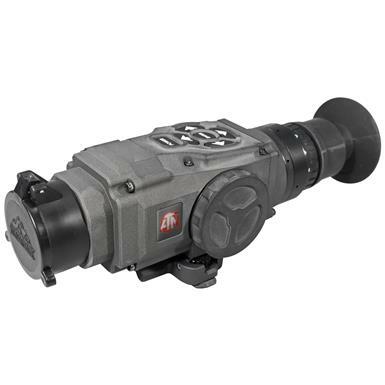 ATN® ThOR-240 1-4X (30Hz) Thermal Weapon Sight. Welcome to the Digital Age of thermal imaging. Pairing a 240 x 180 microbolometer sensor with digital controls for color and reticle display, brightness, and E-Zoom, the ThOR-336 represents the next generation in thermal imaging! The entire Sight is built in the USA, utilizing mil-spec lenses that make the ThOR battle-worthy for most any mission, operation, or outdoor activity. Each ThOR Thermal Scope features a digital menu that gives you a variety of options and adjustments allowing you to customize your system. You can select a number of reticle options, as well as choose a reticle color best suited for your specific application. No more black reticles on a black and white screen... ThOR features a color OLED display, giving you a sharp color reticle every time. Or switch to full color mode and overlay it with either a black, red, blue, or white reticle depending on the conditions and the environment. Additionally, the ThOR will not lose its zero, ever. The unit has no screws or springs that can create targeting errors, and with all digital controls, the ThOR will NEVER allow your reticle to move off base. The ThOR Thermal Weapon Scope provides provide amazing image quality through total darkness, fog, or smoke. Darkness, camouflage or bright lights will not affect the sensitivity. All units have feature E-Zoom to expand your optical magnification up to 4X. They're ideal for nighttime hunting, force protection, border patrol, police SWAT and special operations. And they feature a video-out connection and cable which will let you capture your nighttime operation on video. Top performance and a wealth of features - all for about half what you'd pay for similar tech. Experience the ATN® difference for yourself! Weight: 1 lbs., 8 ozs. Dimensions: 6.73 x 2.72 x 2.87"h.